Looks like everything is going good! Thanks for all the videos and photos!!!! that you wish you were sailing alonge again. Looking good! How is everything else going? Hey Abby. You look great and happy. You'll be out on the water again very soon. Can't wait! Thanks for the up-date, and the video. I enjoyed the little sail and didn’t even get sea-sick…lol… You are looking well rested although you look like you’d rather be back on the high seas again instead of a test cruise, can’t say as I blame you for that. “Wild Eyes” looks good, as do you, and I’d venture to say she’s ready to run again also. I hope that the test cruise was successful and you’ll be able to set sail this week. Hopefully your next blog will come from ‘somewhere out there’. Take good care of yourself and enjoy. Hope the crew is all rested up!!! Enjoyed the video and the beautiful scenery around Cape Twon. I am interested in your thoughts regarding continuing the voyage through the East Indies rather than Southern Australia knowing the fact that winter approaching. You are always a hero in my book. Who hoo! Looks like you'll be good to go soon! Grabbed a sneak peek at your video at work today. The backdrop of Cape Town is quite dramatic...thanks for sharing Jeff's photo and video. It appears you have Scott and Laurence/Dad busy with last minute preparations again today....I can see Wild Eyes had been moving about at the dock early this morning. And Abby....you look wonderful..ready to GO. Take care Abs. John and Louise in Redding CA. Oh in the video, your winch sounded like itneeds a little oiling. True?? And are all your sails and halyards checked, also your stays? Thanks for the Video! Can't wait for the 'adventure' to get underway! It's good to see you rested and smiling. We're excited about your Circumnavigation too. I think you're both pretty special..Jessica and You. Nothing diminishes the accomplishments. I look forward to continuing to pray for you and Wild Eyes, as well as tracking your voyage. You're not forgotten..nor will you be..Glad to see you are looking rested and also getting all of Wild Eyes a thorough going over. Can't wait to read your blogs..and follow you back to California...We're Proud of you too..Don't ever forget that..Be Blessed..
Hey Abby...Thanks for the video and update, looks like things are coming together for you and Wild Eyes. I don't know how strong those winds were during that trial..but they sounded pretty strong, and with no fog left in that bay I'm taking it was a pretty good wind to blow it out. Keep up those spirits, you will be on the water soon enough...and on your way to finish your journey..take care for now. Hope you are soon back on your adventure. I enjoyed the video. Abby, you look so well rested, happy, and ready to resume sailing! The sunset at Cape Town was beautiful. Great to hear about your supplies and cameras. Wish you the best and know you work hard to obtain it. Sounds like the word of the day. Sail on when ready. All the best wishes in the world go with you. Thanks for the video. I'm looking forward to your first blog once you get going. Please think about stopping in Sydney and seeing Jess. She going to have a lot of personal appearances around the country so it will be a good idea to get in touch with her by email or phone if you think you will stop so you guys will know when to meet. Abby you made me feel 15 again and sailing on Barnegat (NJ) Bay. That was 45 years ago!! Enjoy the ride. Nancy M.
Looks quite cozy under the dodger. Must be a relief in freezing rain conditions. Those digital displays showing 20.00 something and 15.4 something, that the wind speed? Loved the video! Could you please post more of them, and pictures? I myself have never sailed and sometimes the whole weather descriptions are hard for me to imagine. Other than that, Abby, I still wish you all the best and fair winds when leaving! Luv the video, had no idea those little windmills were that noise, can't imagine what they are like in 30 knot winds. What a beautiful afternoon, when you and the team took WildEyes out for a test cruise. Sure hope you stop in Sydney to see Jessie, It would be wonderful to see both of you lovely girls together for a lot of pics. Look forward to the continued sail. Thanks for the little sail, Abby. What gorgeous scenery off of Cape Town - wow, it doesn't get any better than that. I hope the boat passed its test run and that you will be on your way soon. Best wishes to you. I soooooo love your blog and it was exciting to see the video!!! Hang in there and be careful coming home to sunny California! Hi Abby! Beautiful video --- thanks for sharing! Hope you enjoy the rest of your time in Cape Town. No wonder Zac loves it so much there --- it is beautiful! Won't be long now and you'll be on your way once again! Thx for the tour of the Cape of Good Hope!!! Wish I could ride back here with you. I'm in La Jolla! You looked like you were thoroughly enjoying yourself! The bay looks beautiful too. I'm glad to hear repairs are progressing. It was really classy of you to take the time to congratulate Jesse too. Hope to see you cast off soon. Nice to see the video! Looks like you'll soon be back on the water on your own! Hey thanks for the great video. You are looking great girl! P/W shows that the Bight looks OK right now. The best friend that you have is your own cool judgment. You are the Captain and your decisions are absolute. Hey Abby!! Looking good. Good luck and be careful out there. I wish you well. Can't wait till you cross the finish line!! Go Abby! Thanks for the glimpse of Wild Eyes and of Cape Town. It must have felt great to get back out on the water and it looked like you had a nice day for it. Best wishes, Abby. Stop asking Abby to stop in at Sydney to see Jessica. Jessica lives just a little bit north of Brisbane which is in the state of Queensland. Sydney is 1,000 kilometers south of Brisbane, in the state of New South Wales. Jessica's around the world journey started and ended at Sydney but she is doesn't live there. While currently she is in Sydney she will be sailing back to her home port before the end of this month. That was a mighty classy congratulatory message to Jessica. It says a lot about you and the mature lady that you are. I guess I am not really surprised about that. Great to see the trials are going well and that you are about ready to launch again. I know you are itching to get going. Looking forward to your repairs report. PS Tell Jeff he could use a wind buffer over the mic on his video camera to eliminate the wind noise. Great videos otherwise, with my thanks. The U.S. will be as proud of you as we are of Jessica. Keep it going and reach home safe. I'll stay in touch with your blog as with Jessica's. John Blades, Mount Martha, Australia. Keep the photos and videos coming after you sail off. I want to see some big waves. Jessica Watson took some photos of 30 foot waves. I probably should've read all the comments and updates before asking this - but can't you still go for the record ....by re-starting from Cape Town? Consider the trip to SAfrica a sea trial! Great video. Can't wait to see you back to your dream! Hope they hooked video cams everywhere! Weather is more predictable in the Winter than it is in Summer. The Indian Ocean is the warmest ocean of them all, some 22 degrees C. You'd be hard pressed to find any icebergs out there. So get back out there, we want to see you surfing the 12 m waves! Keep those pics coming! Thanks! Considering Zac's experience with pirates in the East Indies, I imagine Abby will stick with going around the south side of Australia. Gosh Abby you look so at ease and comfortable at sea. You were definitly meant to sail. Thank you for the trip around Cape Town Harbor. What a stunning backdrop for you and Wild Eyes. Oh by the way the cross that you were wearing was beautiful. Your comments about Jessica where so sincere and heartfelt; you are a very special person Abby. We are all looking forward to the next stage of your great adventure. Please stay safe and ENJOY, ENJOY, ENJOY! God Bless you Abby, your family and that wonderful team of yours. @Dillan ... It's too late for Abby to start at Cape Town on a new non stop record attempt. To be younger than Jessica, Abby would have to arrive back at Cape Town 3 days before her 17th birthday which would be October 16th, just shy of 5 months away. That's not enough time to circumnavigate. It is incredible to watch how a sixteen year old, not so physically strong, can maneuver a 40ft sailboat, let alone sail it around the world single handedly. You are amazing. CONGRATULATIONS ABBY...if my information is correct (subject to your verification) you have left Cape Town as scheduled ....and continuing on with your solo circumnavigation. Fantastic! Be safe...have fun. Let's go sailing!! Fantastic effort ! Get going. If you arrive before October you will still be the youngest solo-circumnavigator, not non-stop, but having been able to finish the task. GO ABBY ! May your sails be full, may you handle safely all the weather conditions thrown at you, and may you enjoy your element to the fullest. Seems that some folks thought that the noise on the video came from the wind generators; that was wind noise across an unshielded microphone, not noise from the generators. I do agree that if they really sounded like that, I'd have been tempted to send them to the bottom just off Marina Del Rey. @Bob, yeah, but her boat is completely fixed now and she's already at the bottom of the world...she could do it in less that 90 days with Wild Eyes. Forget the weather, icebergs, and whatever people are saying she might encounter, Wild Eyes is fast enough to go around anything...she could do it! Great video! Sounds like you'll be sailing away from SA soon. Keep your chin up and dont let the goodbyes get to you. Besides, it not really goodbye is it!!! =) Enjoy the rest of your stay and remember to eat a cheeseburger before you sail off! Looking forward to hear from Abby to confirm whether her attempt on Jessica's record is still on...........if its on.....damn! ITSON!!! And off Abby goes on May 18th. (still an assumption till the official word) I calculated straight line progression at 110 nm/day for her first two legs. Of course she sails much farther in actual distance, probably at least 1.2 to 1. Assuming a continued 110 nm/day which should be a low end calculation because with new auto pilots she should be able to carry all the sail she wants without having to baby the darn things. Anyway, at 110 nm/day, I had to add a waypoint at 90E 42S because a straight line trip from Cape Town to south Tasmania comes very close to 60 degrees S which is not too far from Antarctica and we all know Abby is not going to sail that far south. So CT via the waypoint to south tip Tasmania is 5830 nm. At 110 nm/day, the trip would take 53 days with an arrival on July 10th. For us northern people July 10th is January 10th. So Abby is now sailing in mid winter. With October 16th being her last arrival day at Cabo to be the youngest, I wonder if there are any other possible sailing routes or scenarios which would still give her the record and increase the safety factor. I don't know. Good luck Abby, you are going to need all the luck offered you, this time of the year in the southern oceans. Also setting out with boat modifications that have only been fairly briefly tested. From your pictures you look to be a beautiful shy-ish girl, wish the bloggers did not push/bully you to sail on just yet. @Anonymous May 18, 2010 5:49 AM. Bet you have not faced the winter oceans tempestuous conditions. Fred from Queensland. Go Abby! Your timing for leaving Cape Town is perfect! And who cares if Jessica is already back; you're on your way and have adventure on the horizon! Getting a little tired with this constant, Australia has the roughest ocean in winter BS. You don't like it, don't watch ! You are doing an amazing thing out there. You are building some tremendous memories for yourself and you are going to be one confident lady in years to come. My students are watching your progress and are very inspired by the efforts you are making. I hope you got the letters and enjoyed reading them. We have a bulletin board in the classroom dedicated to your progress. I hope you are getting class credits for your blog entries. Stay Safe! We are all proud of you and amazed at what you are doing and what you have accomplished. It was very wise of you to stop and get needed repairs instead of pushing on and taking unnecessary risks. Setting the record would have been a nice bonus, but again I would like to state that what you are doing is incredible. Everybody wants you to come home safely. @Thomas & Dillan ... Remember a southern hemispheric circumnavigation has to include crossing the equator and circling a northern island most likely Kiritimati island (pronounced Christmas) in the Pacific. Another way it is said, is to cross the equator twice. JW rounded Kiritimati and I thought at the time she was doing it to negate anyone who would question her route for she could have gone a few miles north of the equator and turned south. But with rounding Kiritimati, the potential critics were silenced. 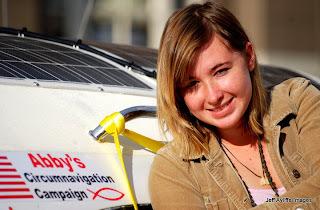 If you include crossing the equator, Abby does not have the time left to circumnavigate from Cape Town to Cape Town. Great to see Wild Eyes racing about! Sea Trials are mandatory ... they iron out those obvious oversights we humans miss. Go Abby with the best wishes from Sydney! I have to apologize. I'm one of those people that were saying Abby should stop in Sydney to see Jessica. I wasn't thinking that Jess would be going home. Silly me. However, by the time Abby gets in Australian waters, Jess might just taking a little sailing adventure to meet up with Abby. It could happen. The person that brought this up is right. Jess lives very far from Sydney so will not be there when Abby arrives. Abby should stop in Sydney anyway. I'm sure she would get a fantastic welcome. Cape Leeuwin to port and then I do not see any need to rush home... I think you should visit the Sunshine Coast. Mooloolaba is not that far out of your way! Looking forward to you starting your adventure soon with a new auto-pilot. Abby, like Thomas said, just stay south and do it Cape Town to Cape Town - you could easily do it in 90 days with Wild Eyes! Go Abby go!!!! Australian weather is nothing, Abby's already seen the worst of her trip. You don't like it, don't watch ! You have nothing to worry about, God will clear your path and keep you from all harm! Some day, I look forward to seeing you and Jessica summitting the tallest peak in the contiguous United States together. That's more than 15,000 feet. And perhaps sailing in a mile-high regatta together. There's a dream. I am really impressed with your poise and determination. When you write your memoir about your trip I will be getting a copy for my 14 month old daughter to read some day. I hope she is surrounded with positive role models like you. May God bless you on your journeys. Best wishes for when you resume your journey. you appear to be a lovely young lady,one I could easily be proud to call my adopted grand daughter!Go Abby, you can do it!.Peter, Newcastle,Australia. As I write this Abby, I can see on the AIS tracking map for Cape Town that your AIS system is on. Maybe you are preping for departure. Sail Safe, and have a good trip.